Although we are an Ocular Oncology clinic, only approximately half of the patients we see will have an eye tumour requiring treatment. 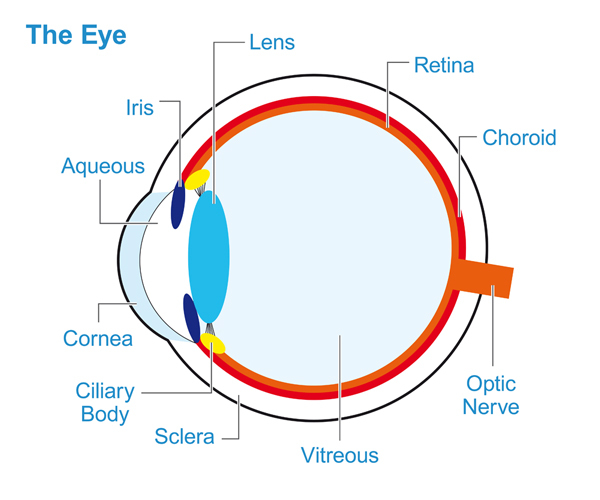 The eye is a very complex organ with a number of layers that may give rise to tumours. The conjunctiva is a moist membrane that covers the surface of the eye and lines the eyelids. The majority of tumours however develop inside the eye within a layer called the uveal tract. 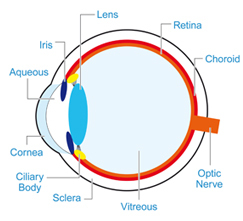 This consists of the iris, the ciliary body (found behind the iris) and the choroid. The choroid provides most of the blood supply to the retina, the sensitive film in the back of the eye. A haemangioma is a benign blood vessel tumour which can sometimes leak fluid and cause blurring of vision. You may be offered a special form of laser therapy called PDT (photodynamic therapy) for this. Bleeding into the eye is not uncommon and because it is dark in colour it may resemble a melanoma. In general the two conditions can be distinguished using ultrasound and if haemorrhage is suspected we may recommend observation to allow the blood to disperse. Lymphomas rarely arise inside of the eye and are difficult to diagnose. You may require a specialist biopsy and specialist treatment, both of which we offer in Sheffield. Melanoma of the eye is extremely rare only affecting approximately five per million of the population per year. The causes of ocular melanoma are unknown however it is an eye condition and is not related to skin melanoma or sun exposure. It almost always only affects one eye and seldom runs in families. Some ocular melanomas are malignant and have the potential to spread elsewhere in the body. The risk of this can be assessed by means of a prognostic biopsy - this will be discussed with you in the clinic. The majority of melanomas within the eye affect the choroid with a small proportion affecting the ciliary body or iris. They may also occur on the surface layer of the eye known as the conjunctiva (see below). Assessment for surgery: If surgery is indicated you will be required to undergo either a local or general anaesthetic assessment. This will probably be performed on your first visit by the assessment nursing team which will mean you could be here for several hours but everything is completed on the same. If necessary an overnight stay can be arranged. Download a PDF with more information here. Metastases are secondary tumours that spread to the eye from a cancer elsewhere. As cancer is a common problem, metastases to the eye are also common, although they may only be detected if they cause symptoms or if detected on a routine eye test. The commonest cancers to spread to the eye are breast cancer, lung, bowel, kidney and prostate but essentially any cancer may do so. The patient is often aware of the diagnosis of cancer however sometimes the eye secondary may be the first sign of a problem and further investigation is required to find the underlying cancer. Depending on the underlying problem your eye may be treated in Sheffield however you may be referred back to a local cancer specialist if more generalised therapy is required. A naevus is the medical term for a freckle or mole. They are benign and very common, affecting approximately 5% of the population. They may be present for many years before they are detected and generally require no treatment. The majority of naevi are small and can be monitored by either your local hospital or optician. Some naevi are larger or show one or more suspicious features in which case we may recommend regular monitoring in Sheffield. We call this kind of naevi an Interdeterminate Melanocytic Lesion (IML) and you can read more about them here. A small proportion of these will develop into melanoma requiring treatment. Melanomas develop from the body�s pigmented cells known as melanocytes. These are found in the skin and within the body, as well as throughout the eye. For that reason freckles or moles can develop on the surface of the eye and are often present from childhood. Similar pigmentation can sometimes develop later in life when it is known as primary acquired melanosis or PAM. A biopsy can generally distinguish a freckle from PAM and will allow your doctor to assess whether any of the cells show suspicious features known as atypia. In some cases atypical cells may require treatment to reduce the risk of melanoma. A melanoma is diagnosed when the atypical cells invade the deeper tissues and this needs to be destroyed or removed surgically. As melanomas may spread outside the eye you may undergo a number of screening tests but these will be discussed with you. Squamous tumours are similar to the commonest form of skin cancer and range in severity from mildly atypical superficial cells through to more severe forms that may invade the deeper tissues. A simple biopsy can generally determine the nature of the problem and allows us to plan treatment. In general, squamous tumours have a low rate of spread outside of the eye. Sebaceous gland carcinoma is an unusual form of cancer which may develop on the conjunctiva or eyelid. It may resemble other benign eye conditions such as eyelid inflammation (blepharitis) and so may only be diagnosed when a biopsy is performed. Treatment is the same as for other conjunctival cancers. Lymphoma is a tumour arising from cells of the immune system and may develop on the conjunctiva. It usually has a pink, rubbery appearance. In general conjunctival lymphoma causes no significant harm to the eye however it may indicate the presence of lymphoma elsewhere in the body. If a biopsy confirms lymphoma you may be referred to a lymphoma specialist who will assess whether there is any lymphoma elsewhere in the body that requires treatment.